Eden Park in Auckland became the first ground to host two Rugby World Cup finals when it held the 2011 final, a repeat of New Zealand's 1987 victory over France. With temporary seating in place for the game, Eden Park nudged a 60,000 capacity, around 12,000 more than its regular gate. The multi-purpose stadium is home of the Blues and Auckland teams, while in the summer Eden Park hosts Test, one-day and provincial cricket. The Eden Park area has been in use for sports for nearly 110 years. It was first the home to Auckland cricket from 1910 and then Auckland rugby from 1925. 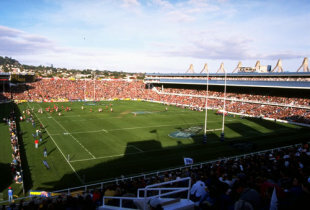 The stadium has also been used for the 1988 rugby league World Cup final between New Zealand and Australia, which drew a sell-out crowd. Situated less than two miles from the Central Business District, Eden Park straddles the trendy suburbs of Kingsland and Mt Eden. Both areas have plenty of places for fans to congregate before and after a match. GPK restaurant on Dominion Road is a particular favourite of local Aucklanders.